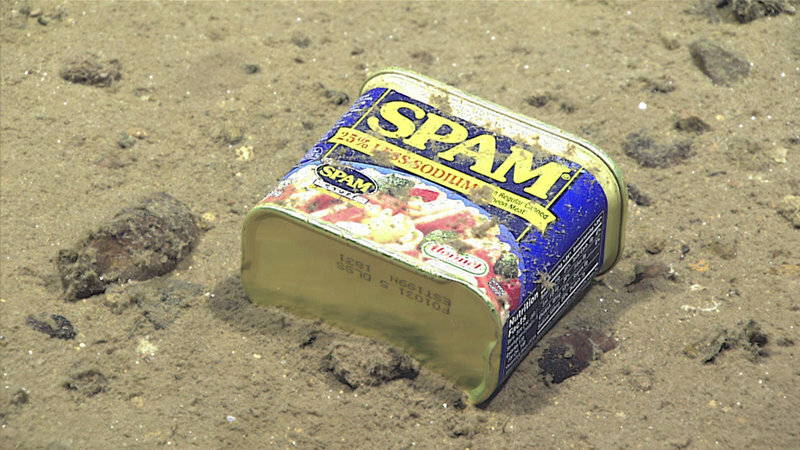 Trash in the deep Video courtesy of NOAA Office of Ocean Exploration and Research, 2016 Deepwater Exploration of the Marianas. Download (mp4, 83.1 MB). Here on the ship, we were lucky enough to celebrate Earth Day, April 22, twice during this expedition – once in Fiji Time, and the next day with our shore-based scientists on the U.S. Mainland and Hawaii. Earth Day began in 1970 as a way to raise awareness about global environmental issues, and has been observed annually ever since. This year (2016), Earth Day was celebrated by the signing of the Paris Agreement, an international agreement to limit greenhouse gas emissions, and a great step forward to mitigating the effects of climate change. However, for the scientists aboard NOAA Ship Okeanos Explorer, the dives on Earth Day were sobering. 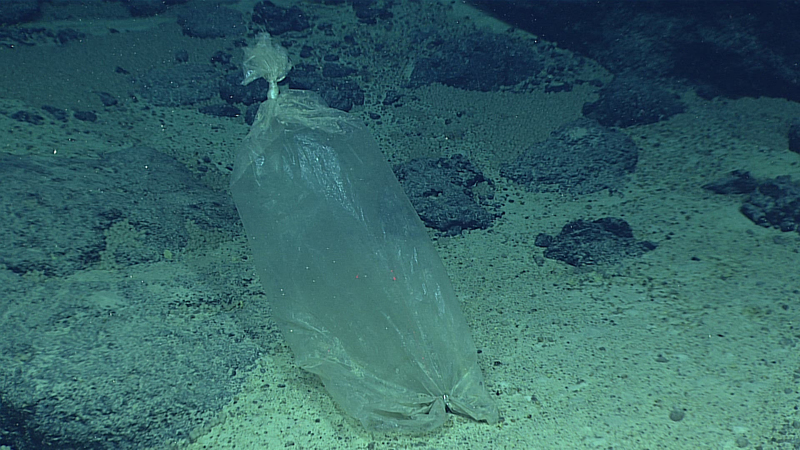 A plastic ice bag, likely blown overboard from a fishing vessel, was also found at Enigma Seamount. Image courtesy of the NOAA Office of Ocean Exploration and Research, 2016 Deepwater Exploration of the Marianas. Download larger version (jpg, 1.2 MB). You may think that working in the deep sea means that we only see pristine environments, but unfortunately that isn’t true. During our 5,000-meter dive in Sirena Canyon, along the Mariana Trench wall, we saw multiple pieces of marine debris. A soda can, a food tin, and a piece of rope all accompanied the fish, corals, and rocks that we imaged as we moved up the slope. We encountered even more trash (nine pieces!) on our dive the following day at Enigma Seamount, including several plastic bags and a piece of clothing. Even here, in one of the deepest places on Earth, humans have left their mark. Contrary to popular belief, the deep sea – the largest ecosystem on our planet – is not immune to human impacts. Its remoteness has led to purposeful dumping in the past, not just of trash, but even pharmaceutical waste and munitions. Better understanding of just how long it takes for marine debris to decay in the deep sea has led to new regulations to protect these areas. Currently, disposing of garbage at sea is regulated by the International Maritime Organization’s International Convention for the Prevention of Marine Pollution from Ships (MARPOL) Annex V, which first entered into force on December 31, 1988. After several amendments, Annex V now prohibits the discharge of almost all garbage at sea, with the exception of food and some liquid waste (such as water used to wash a ship’s deck). 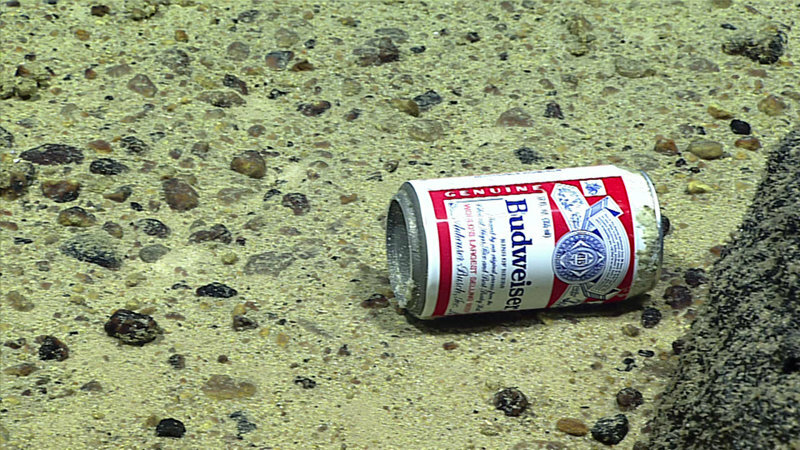 A beer can seen at 3,780 meters depth at Enigma Seamount. Image courtesy of 222. Download larger version (jpg, 1.8 MB). Slowly but surely, mindsets are changing globally regarding how humans deal with trash. This is exemplified not only by the strengthening of MARPOL Annex V to prevent disposal of garbage at sea, but by greater efforts to recycle, to limit the use of plastics, and to find biodegradable or “green” solutions that reduce trash. Hopefully, these and other mechanisms will help to prevent continued accumulation of deep-sea marine debris into the future. Marine debris can come from both land-based activities, too, and is not just a coastal problem. Litter and trash from cities and towns miles from the ocean can indirectly find their way there. Litter on the ground, trash from overflowing bins, and other human-made items can be picked up by the wind or washed into storm drains by rain and carried into streams and rivers that eventually carry the trash to the ocean. Once the trash reaches the ocean, it can be carried great distances by wind, waves, and ocean currents. We often think of marine debris accumulations in the garbage patches, but marine debris is everywhere — reaching every part of the ocean. Always remember the three R’s – Reduce the amount of waste you produce, Reuse items and choose items that can be reused, and Recycle as much as possible! To learn more about marine debris impacts and how you can help, visit: https://marinedebris.noaa.gov/. A food container, seen resting at 4,947 meters on the slopes of a canyon leading to the Sirena Deep. Image courtesy of NOAA Office of Ocean Exploration and Research, 2016 Deepwater Exploration of the Marianas. Download larger version (jpg, 1.4 MB).